If the Board can be considered the mind of a community group, the meetings are the heart. This is where all major decisions are made and the Board comes together as a group to steer the organisation towards its mission. When it comes to recording these meetings though, what's what? What must be recorded and how? Who should manage the minutes and how should they go about it? 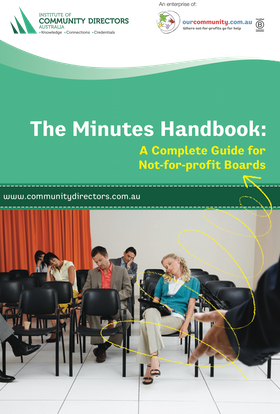 The Minutes Handbook will guide you from minutes-madness to a better way of minuting in no time at all. What goes on the agenda? What makes a good agenda? Who can vote on the minutes? How long do I have to keep the minutes on file? Who is allowed to see the minutes? Our Community has published an entire series of "how-to" guides that can help with your marketing, governance and fundraising needs.